This past summer, Olivia attended a summer intensive for musical theater in New York City. We packed our bags and lived like locals for two weeks in the city that never sleeps. In that short time, we were able to take in several Broadway musicals. One that we both really enjoyed was Come From Away. This post may contain affiliate links. That means if you click a link I may receive a commission. Read more about my disclosure policy here. If you don’t know the story, Come From Away is based on a true story about a town in Newfoundland where 38 planes were grounded in the hours following the tragic attacks on 9/11/2001. It follows the lives and stories of one pilot, many passengers, and the locals in the small town of Gander for five days after the attacks. As you might expect, it’s a roller coaster of emotions and varied aspects of the human experience – fear, anxiety, guilt, birth, death, love, breakups, and new friendships – magnified by the intensity of the occurrences on that devastating day. That trip wasn’t Olivia’s first time in NYC. She’d been three other times – once in 2015, once in 2016 and our Christmas 2017 family vacation. But it wasn’t until the trip in December that I realized she, nor Alexandra, had any real perspective on what happened on 9/11 because they hadn’t been born yet. For them, it was purely historical. I have to admit, I was skeptical at first. A musical about 9/11? That’s a heavy topic for something that was supposed to be entertaining. I hadn’t really read the synopsis and the reviews thoroughly. Also, I was pretty adamant about making sure we attended shows that fully reflected diversity on stage during that trip. That didn’t seem possible in a show based in Newfoundland. But with Olivia’s continued urging and confirmation of the show’s quality from a theater friend, I bit the bullet. And I am so happy I did. Not only is the show phenomenal, but it presents the happenings of that day from a point of view that isn’t completely devastating. It helped me find the words to have an age-appropriate discussion with Olivia. Get tickets to your favorite Broadway shows for less with Today Tix! 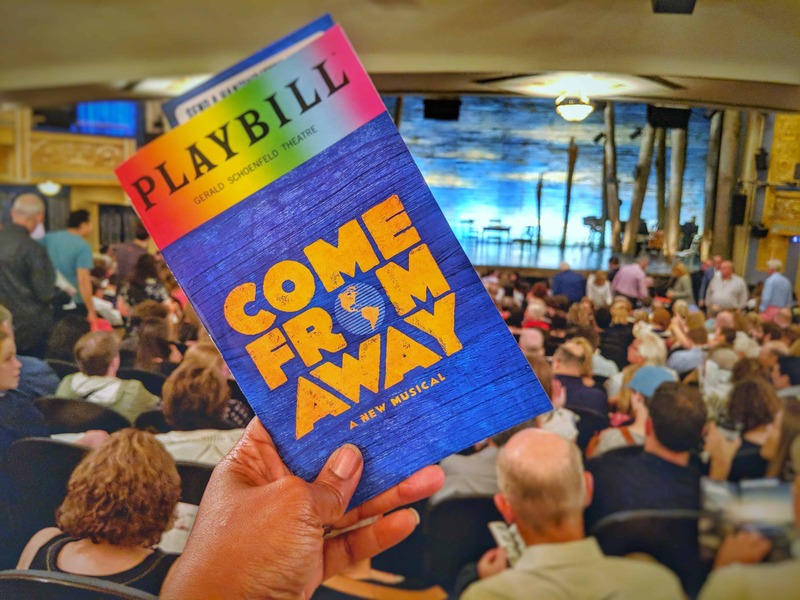 Come From Away helped me explain the helplessness I felt as an outsider looking in. Many of the characters had personal and direct connections to New York City. Others had connections to pilots and airline staff. But everyone felt the desperate sense of wanting to do something, but not being able to do anything. The show helped me explain the chaos that ensued in the days after the attacks. My sister lived in New York City on 9/11/2001. We were not able to contact her for days. What few cell phone towers there were at the time were jammed. The internet was overloaded. The US airspace shut down. There was literally nothing coming in or anything coming out of NYC. For days. As a GenX/Xennial parent of a GenZ child, trying to explain not being able to use your cell phone was harder than it should’ve been. This Broadway musical helped me teach my compassionate child how fear can breed bias and prejudice. Ali (Caesar Samayoa), a Muslim passenger grounded in Gander, was harassed, challenged, and accused of being a terrorist. In the months following 9/11 when random additional searches were implemented on all airline flights, Harold was “randomly” selected for search every time we traveled. Random. But ultimately, Come From Away helped me explain that all tragedies don’t have to remain tragic. The people of Gander opened their homes and lives to the “plane people” for 5 days. Those who were grounded in Gander have given back to that town and to their own communities in many ways. They took what was probably the most difficult time of their lives and turned it into an opportunity to pay it forward with scholarship funds, foundations, organizations, and annual days of giving. This was the most inspiring lesson I was able to teach her. How are you teaching your children about 9/11? What has been the best way you’ve found to convey what you experienced?